Daily Survival: Better Barter Preparedness, by Dan H.
I've heard a lot of suggestions about bartering. Some of them are good ideas, while others might be dangerous. 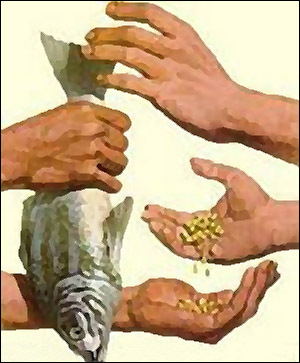 Bartering is just trading, either goods for goods, goods for services, or services for services. First of all, we need to ask why we are bartering at all. If we need to barter, it is probably because we need (or just want) something we don't have, and someone else needs or wants something that we have. If something isn't exchanged by both parties, then it's essentially a begging or charity situation. It is best to put yourself in a position where you don't need to barter at all. Have everything you need. If you don't have enough food, water, shelter, weapons, medical supplies, communications equipment, gardening supplies, energy, transportation, books, tools, or skills, then you need to get those first! Try to prepare yourself to the point that you have enough for charity. None of us can be totally prepared as an individual. Very few of us can be totally prepared as a family. Even few multi-family groups will have everything they will ever need. This is why you will need to prepare for bartering. Ideally you want to be prepared enough that you don't need to barter for tangible items (food, weapons, etc.). It is very difficult, however, to have all the skills you might need. Some of the skills you may have to barter for might include medical, veterinarian, electrical, mechanical, machinist, or heavy labor. Those first skills I mention can take years of training and practice to become proficient. The need for those skills are probably obvious. The last one, heavy labor, might not be considered a “skill”, but clearly it isn't something you can store up for years. Labor help might certainly be needed by the weak or elderly, but even a strong young family might need help with a bigger project (large crops, digging an irrigation system, constructing a building, cutting wood, etc.). Now that you know why you might need to barter, the question becomes what do you use for barter? A skill is a very valuable thing to have. As I have said, for most people, skills are hard to store for a rainy day. And if you are the one with a valuable skill, it takes no room for you to store it. And, when you give your skill to someone, you still have it when you leave. Most of us, however, will be trading something tangible for a skill or for something tangible. Think of tangibles you can get now, that might be valuable during TEOTWAWKI, that store well, cost little, and can be hard to make. I strongly suggest that the primary item you store for bartering is food. Look at almost any big disaster, or the lives of people in Third World countries. Food is generally the most sought after item. Use your head when you barter with food. Don't do anything to give the impression that you have lots of it. You may want to act like it is your very last meal and you're only trading it away out of desperation. You don't want someone coming by later and taking the rest of your food by force. Other items I would suggest are lighters, matches, toilet paper, feminine protection, duct tape, razors, soap, lithium batteries, aluminum foil, coffee, small bottles of drinking alcohol, and cigarettes. Those last items may be very desirable to those with addictions, even if you don't use them yourself. Fuel might also be used for barter, but its bulk, hazards, and shorter shelf life might make it hard to store enough to spare any for barter. Generally, you should probably not barter your own firearms and ammunition for other goods. First of all, if you're trading your firearms away, it must mean you didn't store enough of something else. Extra guns and ammo can be expensive. Use some of that money to get more food and other supplies so you are less likely to need to barter in the first place. And, the price of a gun can buy an awful lot of the other bartering items I mentioned. My second thought would be concern that the gun or ammo would be used against you or your family. If you're willing to trade a gun to someone, it should be someone you would trust with your gun at any time. I might barter a gun in exchange for a service, or barter to someone who already has a gun. If you trade it to the wrong person, you might truly be at the loosing end of the deal. Don't get me wrong. You need plenty of guns and ammo for yourself, your family, and maybe some spares. My plans, generally, don't include using them for barter. You definitely don't want to be in a position of having to barter to get a gun. If you notice, I haven't mentioned water as a bartering item. That's because I think you should not barter with water. First of all, you should have planned well enough that you will not have to go to someone else for your water. And, if you have water to barter with, then you can afford to give it away to someone in need. I think nobody should be deprived of water if it's available. If you have the only water hole in 50 square miles, then share! It's just the right thing to do. Water is more replaceable. It can fall from the sky, food generally doesn't. After you get your bartering supplies in order (remember, get your personal supplies in order first), then you should make a list showing what items you are willing to barter away, and how many of those items you're willing to get rid of. At the end of the list, you should make some notes telling why you decided what items are to be bartered and why. If you're not around to make the bartering decisions, the list can be a great benefit to whomever is bartering. So, plan ahead. Be smart about who you barter with. Store enough supplies for yourself, for charity, and for safe bartering.